Last week we held our annual end of year celebration and graduation. We had no children graduating this year due to long distance moves and job losses, but we celebrated with a pot-luck and campfire with s'mores anyway! The "theme" (if you will) of the evening was slowing down for our children. I see so many busy busy parents come in our doors...busy with work...busy with activities...busy with social agenda...busy fulfilling the expectations they have set on themselves due to the pressures of society, neighbors, friends, and family. We need to consciously slow down in order to protect our children's childhood. All of them say, 'Yes, dear,' and never notice me. What do you remember from the time you were a child? Do you think of moments memory knows well? That trigger stories memory wants to tell? Is it painful? Is it pleasant? Is it somewhere in between? Are there things you always wished that you could say? So the memories will protect you when they can. What songs and smells and gatherings come easily to mind? What have you learned of love from who loved you? And find a future you can still make new? And what about the children you find around you now? Are you making time to sing and talk and play? Protection that'll never go away. Please, please slow down...listen to your children...provide those memories for them! 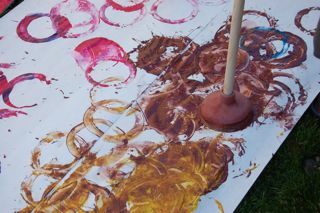 Note: plunger painting photos are from a school day...not from our celebration!